Love & Lentil: Make Yogurt at home - and then make Shrikand too at home! Home made yogurt looks so good, never tried at home and very very.... lovely dessert to finish off the meal. I have now words reading your post!!! So craving for some shrikand now. Wish I lived next door! Omg, srikhand and puri is one of our all-time favorite dinners!I have never tried strawberry or chocolate srikhand, but now I just have to :) Looks scrumptious!! Just awesome!! 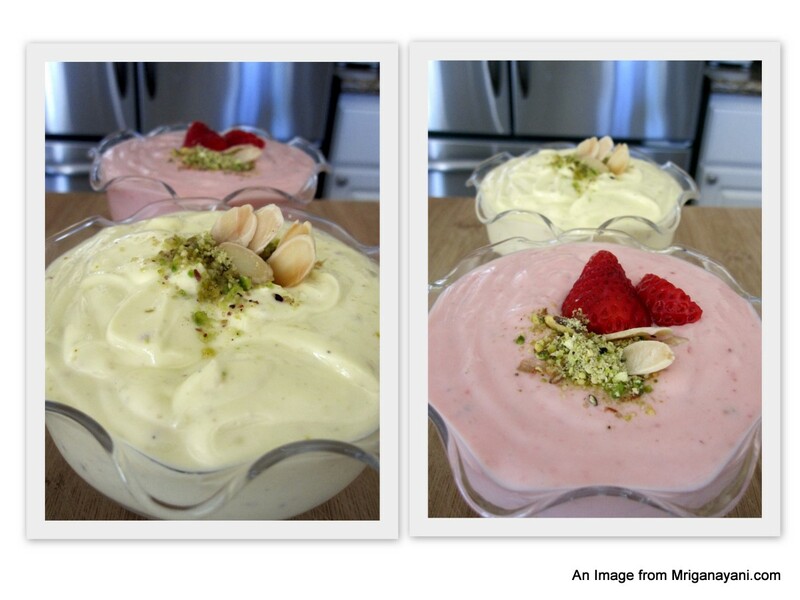 You are tempting me to make shrikhand with your lovely pictures! It's funny I made shrikand this weekend as father's day spl! I didn't make the strawberry one, mild pink is sure a delight for the eyes! omg! this is just... ughh!! i dont know what to say! i HAVE to make this over the weekend now. its all your fault! Thanks for your visit to us..You too have an amazing space here..Loved this post yaar...Hope to see you often..
i always prepare the yogurt at home..homemade one is really good. but i add the curd only after cooling the milk. but i think warm milk also it work so perfect.. The shrikand looks really delicious . really liked the strawberry version..
Wow thats wonderful post anu.. Chocolate idea is fantastic. I really loved it.. all the pictures are awesome which makes me drool. Lovely and simple post, love the way you have presented it and the bowl too. wow what an awesome description!! love shrikand!! lovely step by step demo of shrikhand which looks so tempting that I am coming over to have some. I never planned or thought of making yogurt at home...very tempting shrikhand...fabulous post dear..
Did you read my mind or what? I made strawberry shrikhand on Tuesday too...uncanny this! Only, I made mine with strawberry crush. I made enough shrikhand for myself, ate my to my heart's content and was levitating in shrikhand nirvana, when I realised I hadnt taken pictures...bah! @ Umm - you're right..one of the best desserts. Or a whole meal by itself too! LOL! @Divya - thanks...its time we all meet soon! @ Priya Mitharwal - LOL...chocolate is OMG definitely. Like OMG..why don't I just eat this everyday? @ Ameya - if you are a chocolate lover, you've got to try it. Enjoy! @ Priya - maybe strawberry shrikand is a good treat for mother's day with all the pink...I think its a treat for any day actually! @ Nags - sure..make it all my fault. Even global warming! LOL! But I do just want you to make it and eat it!! @ Kairali Sisters - thanks for stopping by. You are most welcome here! Please do come by often! @ Prannis - thanks! Yeah...with my experimentation, slightly warm milk makes thicker curds. Might not be true..but works that way for me! @ Pavithra - chocolate does make everything better - its a known fact now!! @ Niloufer - thanks! do try and let me know how it turns out! @ Shanthi - thank you thank you!! @ Cooking Blog indexer - Yeah, the milk has to be a little warm so that the bacteria in the culture can start working. Its similar to using yeast while baking. Cold milk kills the bacteria. Warm develops it! @ Kitchen queen - you are most welcome. I'll have your cup ready! 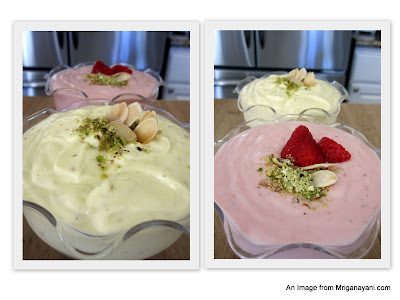 @ Priya - make some plans now to make yogurt - you'll love the results! @Madhuri - what can I say. We are now telepathically always connected by food! LOL! @ Meeso - You can do it. Really. Its pretty easy. Do try and let me know. I'm here for moral support!! LOL! @ Anonymous - I used the culture I have at home. Some store bought yogurts don't work good as a culture. I hear that Pavel's yogurt works good. With the store bought stuff, you probably need to make yogurt at least twice or thrice before you start getting the correct consistency - so maybe, make it in smaller batches. Your best bet would be to find an Indian friend or a neighbor who can give you a couple of spoons of yogurt culture. Lovely.. seriously, lady, why are you so hell bent on breaking my diet..lol..this is sooo good. My friend's mom in Irvine uses lebanese cheese (Kefir cheese) to make shrikant and it is really good as lebanese cheese is sour. I used it too and loved it.. BTW, where do you get the saffron syrup from? Please let me know.. and thanks for the step by step pictures.. I love it..
@ Anonymous - I'm guessing you made it when the milk was really hot. Either that, or the culture was not enough for a good thick dahi to set. Please keep trying - make smaller quantities. You can actually even trying setting small quantities in individual cups. Those get done faster too and if it does not get set correctly, at least you won't be wasting too much and you can try again. Also, if you are just beginning to make Dahi, go with the whole milk for making dahi. The fat in that helps to make thick curds. Once you have the process mastered, you can come down to low fat dahi if you want to. You've got a great food blog with drool-inducing pictures. I am planning on making the Saffron Shrikand for Diwali and I want to know where you purchased the liquid saffron. Also, this is an unrelated question to this post, but where did you get your kutti vengayam for the recent vatha kuzhambu post? Hi Meenu - thanks for stopping by. The only place I've seen this liquid saffron is in Nilgiris, Coimbatore. I'm not sure where you live - but if you are close by there or have any other Nilgiris close to where you live - check with them. The kutty vengayam was from my Indian store here in Irvine. Most of the indian stores carry them. If you are in the US, even some American grocers carry them - they're called pearl onions in many stores. Thanks again for stopping - let me know how your Shrikand turns out! Happy Diwali! Thank you so much for ur prompt reply.I live in NJ and I thought that you might have gotten the syrup at a health food store here in the US as I have never seen it in India before. I will try at Nilgris the next time I'm in India. The pearl onions I get here are very small. In your picture, the kutti vengayam looked exactly like the ones we get in India. I am making do with shallots which are okay, but I do miss the madras sambhar onions. The Shrikand turned out really rich and creamy even though I made it with the store bought dahi(After repeated attempts at making yogurt at home, I finally conceded defeat and stick to store bought ones).My daughter loved it. Thanks for the recipe. I have an eye on your Tiramisu recipe. Will keep u posted on how it turns out. It seems to be an easier one without having to struggle with the lady fingers.